Earlier this year, reports surfaced of a surviving Nintendo PlayStation prototype from the short-lived partnership between the two video game giants. Many were skeptical if the device was real. But now there’s video of the prototype powering on and playing games. 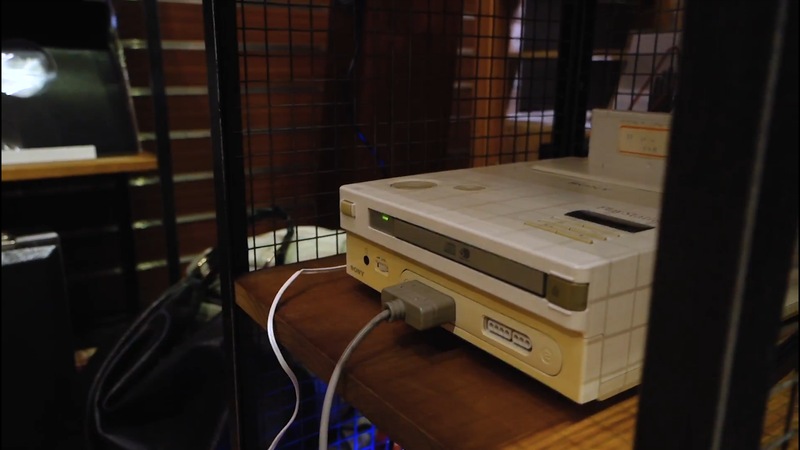 Video footage of the Nintendo PlayStation prototype comes via Engadget, who also have an in-depth interview with father-and-son owners Terry and Dan Diebold. The elder Diebold explains that he got the prototype at a bankruptcy auction of a company where former Sony Interactive Entertainment CEO Olaf Olafsson worked. The company I worked for, Advanta Corporation, they filed for bankruptcy (November 8th, 2009). When they did that, we purged the buildings. What you do is you take pictures, you itemize, and then they had an online auction. And I had gotten into the auction myself because there were a few things I wanted to buy. So I knew what were in certain lots. And when they called out the certain lot number, I raised my panel and I ended up winning it. You want to hear the ridiculous price? $75. It should be noted that the games shown in the video are running off SNES cartridges. And while the CD drive for the hybrid device doesn’t work—intentionally disabled, it seems—chips with Nintendo and Sony branding can be seen in pictures of the motherboard. So, while this rare piece of gaming history isn’t fully functional, the documentation in the video appears to prove that this Nintendo Playstation is the result of a failed joint effort that could have changed gaming history. Head over to Engadget for the whole story.